“Little Jimmy is sad that he has such a crummy playground, but his pal, Little Stevie comes to his rescue, and shows him there is a bigger world out there.” Respond here. “I learned something interesting during the earthquake on Sunday: they are hard to feel if you're standing on rubber playground surfacing. During the big earthquake (centered in Mexico) my husband and I were at a San Diego park, standing on rubber surfacing while watching our kids play. When the earthquake hit we didn't notice a thing, but other park patrons who had been on the dirt asked us if we just felt the earthquake. And when I talked to people I knew later, they had all felt the strong quake easily. So I guess that rubber surfacing has very good shock absorbing capabilities!” Respond here. “I have found the cutest side project and one that could be used as a fundraiser too! I am so excited to share this one because it will help promote your playground, help the enviroment, and the area you live. This town has taken barrels and hand painted them to turn them into recycling bins. "My first thought was to make some to go around our center and the future playground. Then I thought about the idea of making several and sell them to local businesses and/or parks? I have several girls that are interested in helping and I am going to talk with Lowe's Home Improvement about donating the paint supplies. Also, if you take a look at the pictures in the link, they look like they are made from metal but they make plastic ones too. I am looking into the cost and possible a donotion for the barrels now.” Respond here. Playgrounds and beyond! You could easily while away a day at Look Memorial Park in Florence, Mass. 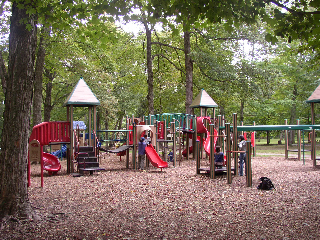 As noted on our Playspace Finder: “Mill River runs on the border of the park. Evening concerts are held in an outdoor theater during the summer. Cross-country skiing and snow-shoeing during the winter. 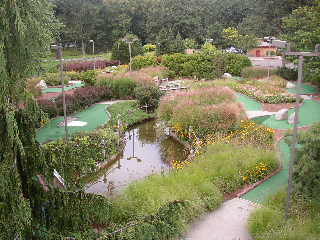 There is an animal zoo, a miniature railroad train ride, water bumper boats, miniature golf, and pedal boats.” And a reviewer adds: “There are large open fields for game-playing or kite-flying.” Add a rating or review here. St. Mary’s Episcopal Church in Bonita Springs, Fla., has raised $2500 of the $25,000 it needs to build a new playground. According to project leaders, “We're hoping to build a playground so fun, safe and amazing that children will look forward to coming to St. Mary's even more than they do now. They will have a place to run and laugh and play with abandon. We already have many families visit our thrift store from surrounding neighborhoods, and they could stay and play in our playground. If we build it, we hope many children will come and play!” Join the project here.